At 4.7 inches and 5.5 inches, respectively, the iPhone 6 and 6 Plus screens are far bigger than the 4-inch displays found on the iPhone 5s and 5c. Both phones have an impressive new "Retina HD Display" with the iPhone 6 featuring a resolution of 1334 x 750 (326 ppi) and the iPhone 6 Plus featuring a resolution of 1920 x 1080 (401 ppi). Basically, if you're looking for a larger screen for browsing the Web, playing games, or watching movies and TV shows, the iPhone 6 and iPhone 6 Plus are far better options than their predecessors' comparatively diminutive displays. However, same as other model of iPhone, one of the few drawbacks is that you cannot play your DVD movies on iPhone 6/iPhone 6 Plus directly. How to put a DVD on iPhone? Thankfully, all is easy as you can make your DVD movies playable with a quick conversion tool. Read on to find out how you can rip and convert DVD to iPhone 6, iPhone 6 Plus and any other iPhone model compatible format with ease. The recommended DVD to iPhone converter is EaseFab best DVD ripping software. It can professionally rip DVD movies to iPhone 6, iPhone 6 Plus, iPhone 5S, iPhone 5C, iPhone 4S, iPhone 3G or 3GS, etc. supported MP4/MOV/M4V and other regular video formats like AVI, WMV, MKV, FLV, 3GP, etc. and even extract audio in MP3, WAV, WMA, etc. for play anywhere you like. Besides, it has outputs for iPod, Apple TV and iPad (including iPad Air, iPad Mini 2). Play DVD on Android mobile phones is also a simple case with this DVD converting tool. Free Download DVD to iPhone Converter, install and start it. 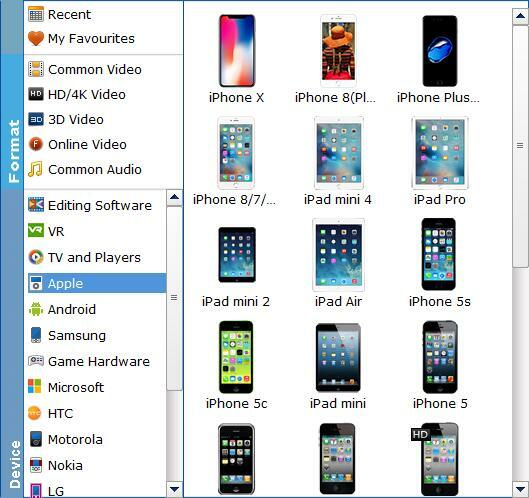 Then follow the steps below to copy DVD movies to iPhone 6 and iPhone 6 Plus easily and quickly. Video presets for iPhone 5S, iPhone 5C, iPhone 5, iPhone 4S, iPhone 3GS, etc. are provided. You can just simply select "iPhone 5S" model as the output video format. The output videos fit iPhone 6/iPhone 6 Plus nicely. Note: EaseFab DVD Ripper now has outputs for iPhone 6, 6 Plus. Of course, the iPhone 5S also works on iPhone 6/iPhone 6 Plus without any problems. At last, click the Convert button to begin converting DVD movies to iPhone 6/iPhone 6 Plus or other iPhone model immediately. The conversion will be finished only in a few seconds. Once you ascertain that the conversion is successfully completed, you can import the file anywhere you wish to even in the media player as long as the file is iTunes friendly. First, locate the output file where you have saved the videos. Then open the iTunes app so that you can import the output videos to it. This can be done by dragging and dropping the media file. If the transfer is successful you can further transfer the converted DVD file to your iPhone 6, iPhone 6 Plus, iPhone 5S, iPhone 4S, iPod Touch, the new iPad Air, iPad Mini, iPad 2, Apple TV 3 and other portable devices and you can easily enjoy them everywhere you wish to.